Everytime I walk into DiGiulio Brothers I feel like I am hearing these Billy Joel lyrics. When I think of neighborhood Italian Café, I think of DiGiulio Bros. When I think of a romantic Baton Rouge spots, I think of DiGiulio Bros. It’s a Baton Rouge standard and staple. There’s history and comfort in this small quaint place. There is an old world feel with a balance of contemporary and traditional dishes. It has regulars but it is also extremely welcoming. You can sit inside or when the weather is perfect, like today, you must take advantage and sit outside. Of course, it’s also family friendly and a place to bring your children. What are the highlights? DiGiulio Brothers does perfectly poached eggs and knows exactly how to fry! The breading is crispy and delicious, whether a fried crab, an eggplant medallion, or veal. Their frying is something special. The service was extremely quick and attentive. They really care about your experience. There was never an empty glass and the waitress was very informative about the menu. Great service! (Ask about the “Richard Special”. You will love it and definitely think it’s special). We got a Bloody Mary and a Screwdriver. Both refreshing and delicious. They have a full bar and excellent mimosas. Of course, they have wine and lots of it! There is a full bar menu. We highly recommend you start your meal with an order of these biscuits. Two come to an order with jam, honey, and butter. They are the sort of biscuits that melt in your mouth. Flaky, full, and perfect! Perhaps the best minestrone in Baton Rouge. Large vegetables and plenty of them. Baton Rouge Brunches also recommends that you consider asking for a meatball inside of the soup. Don’t be scared. They encourage this combination. The meatball a game changer. 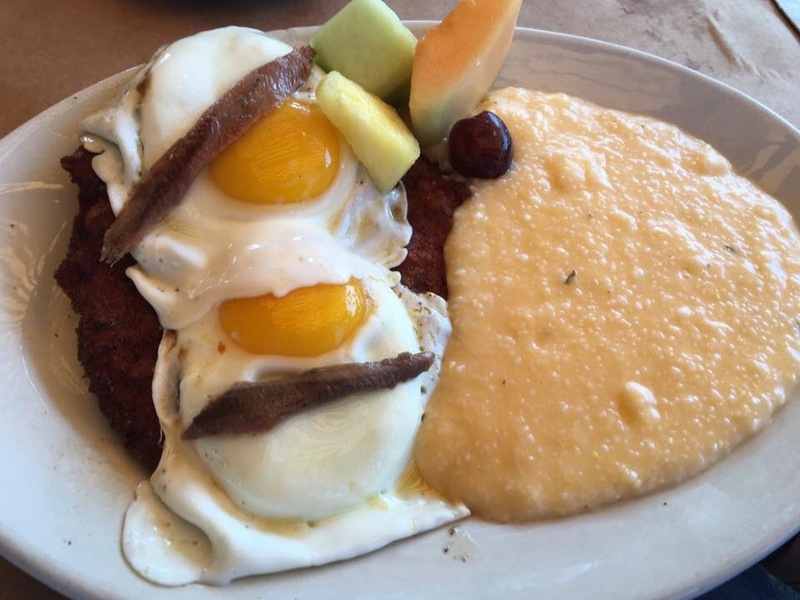 Two perfectly poached eggs on crispy fried eggplant medallions, topped with a delicious creole sauce and served garlic-cheese grits and Italian sausage. The eggplant is the standout part of this dish and it is an outstanding combination! The grilled tomatoes are excellent addition as well. You choose your own adventure for this dish. You select 3-4 ingredients. The mix is cooked in spaghettini and cooked as an Italian omelet. We selected meatball, black olives, cheese, and mushroom. The egg in the middle was perfectly runny. This comes with frest fruit. This is their version of Eggs Benedict. It’s a solid choice! The dish is served on English muffins that were perfectly toasted, topped with soppressata, poached eggs, and hollandaise sauce. The sauce isn’t drenched over the dish, which makes a great complement to the taste but is not overwhelming. Served with grilled tomatoes and garlic-cheese grits. Great take on this traditional brunch dish. Picture breaded veal fried to crispy perfection. “A breaded scallopine of veal.” Top the veal with a fried egg (we like two fried eggs so we get an extra one) and add anchovies. Served with your choice of garlic-cheese grits or spaghetti. This was our favorite dish of the day. It’s saltiness is welcomed and the veal delicious. This is a brunch special. 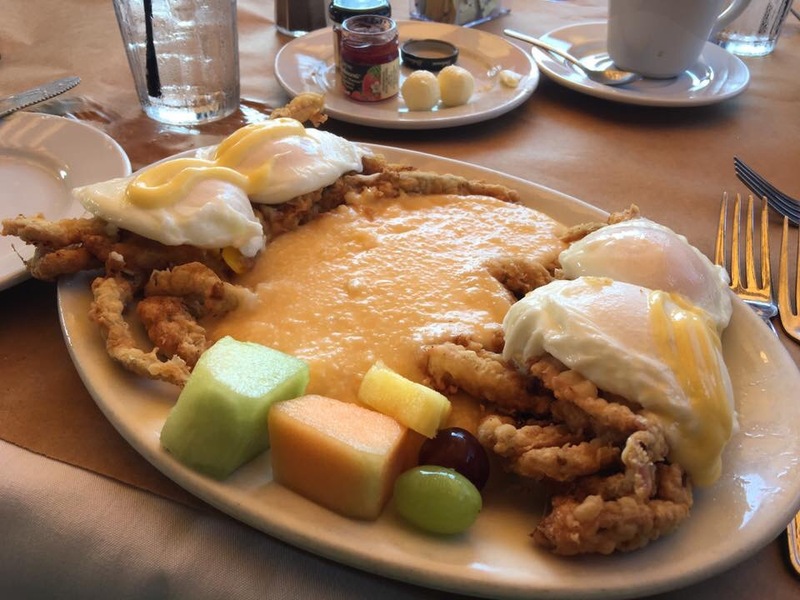 You get a soft shell crab topped with a perfectly poached egg, topped with hollandaise with garlic-cheese grits. It was out of this world! Soft Shell crab and Poached Eggs (double order) This is a brunch special. You get a soft shell crab topped with a perfectly poached egg, topped with hollandaise with garlic-cheese grits. It was out of this world! “A bottle of red, a bottle of white, whatever kind of mood you’re in tonight. 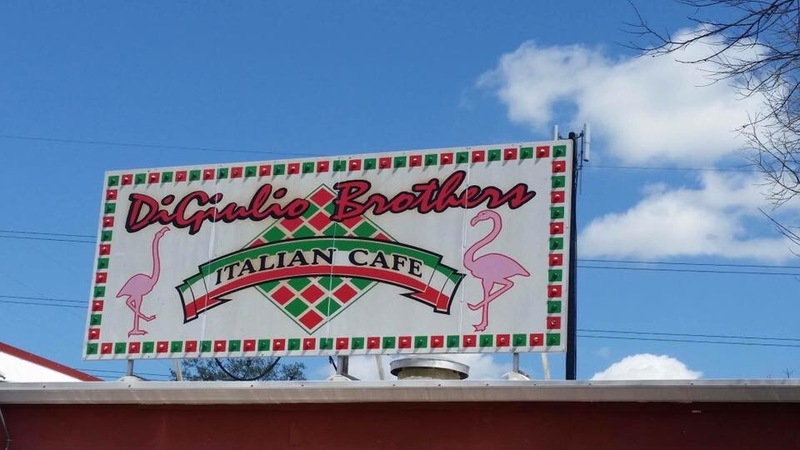 I’ll meet you anytime you want, in our Italian restaurant.” Baton Rouge Brunches will definitely meet you anytime you want at DiGiulio Brothers! You absolutely should try this historic and welcoming place for brunch.